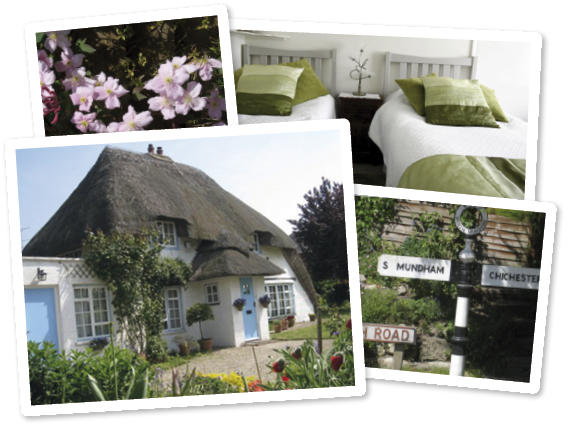 Welcome to The Cottage self-catering Studio, attached to a charming, listed thatched cottage in the attractive village of North Mundham, near Chichester. Located 2.5 miles south-east of Chichester, in rural West Sussex, we are ideally situated for the sea, West Wittering Beach, picturesque villages in the South Downs, Goodwood, as well as local attractions and events. The adjoining self-contained studio of The Cottage offers a light and airy twin room, modern bathroom and kitchenette. You will also find a pub, the village church, country footpaths and a bus stop within walking distance. Other places of interest such as the Fishbourne Roman Palace and West Dean Gardens are only a short distance away. © 2019 The Cottage. All rights reserved. Website by Maroon Balloon web design.